Capital of the island of Sardinia. It had a Jewish community in early times. When a Christianized Jew named Peter placed images of saints in the synagogue of that city on Easter Monday, the day following his baptism, to the annoyance of the Jews, Gregory I. ordered Bishop Januarius of Cagliari to have the objects at once removed (Grätz, "Gesch. der Juden," v. 52). Little is known of the history of the Jews of Cagliari. Under Aragonian rule their condition was favorable, for they were not molested and were received at court. When King Martin I. of Aragon was at Cagliari in Dec., 1408 (he died in that city in 1409), and the Jews were looking on at the or Daus games instituted in his honor, he invited one of them to take part in the game, and the Jew finally consented, although the community had issued a decree four years previously, interdicting this game to every Jew and Jewess on pain of excommunication. 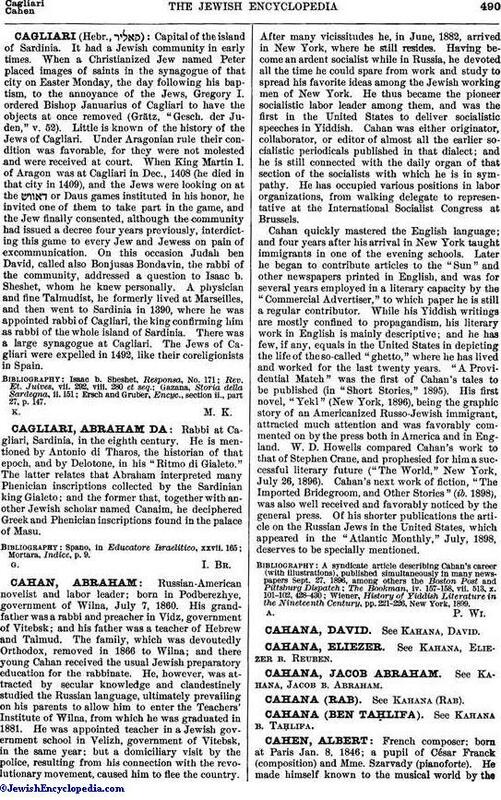 On this occasion Judah ben David, called also Bonjusas Bondavin, the rabbi of the community, addressed a question to Isaac b. Sheshet, whom he knew personally. A physician and fine Talmudist, he formerly lived at Marseilles, and then went to Sardinia in 1390, where he was appointed rabbi of Cagliari, the king confirming him as rabbi of the whole island of Sardinia. There was a large synagogue at Cagliari. The Jews of Cagliari were expelled in 1492, like their coreligionists in Spain. Ersch and Gruber, Encyc., section ii., part 27, p. 147.